Staff at the City of Edinburgh Council, who face wholesale privatisation, have just received a UK award for delivering efficiencies that are unrivalled across the UK. The Government Business Awards cover a variety of categories and Edinburgh is the outright winner of the Financial Performance Award. The City Council recently announced the intention to bring the private sector in to run a whole range of council services in the hope of delivering efficiencies and savings. 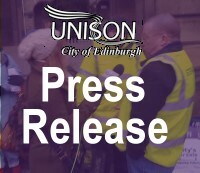 Reports to council expressed concern at the ability of existing managers to deliver budget savings and highlighted English examples of privatisation as an alternative way forward for Edinburgh. However, the Government Business Award for Financial Performance places a serious massive question mark against the benefit to be gained from breaking up a winning team.